New Disease Reports (2001) 3, 1. 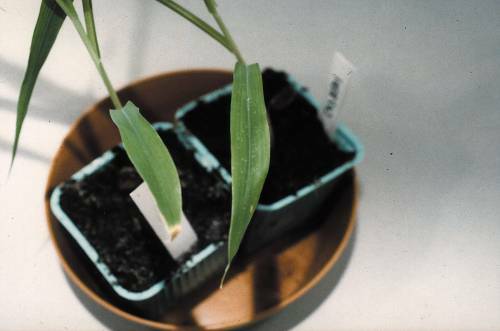 Chlorotic spots were observed on 4 week-old maize (Zea mays) plants during April 1999, in a research plot in the district of Yaounde, Cameroon. Further surveys revealed that these symptoms occurred widely in farmers' fields and had been prevalent over the previous three years, causing severe chlorosis and reduction of growth in affected plants. 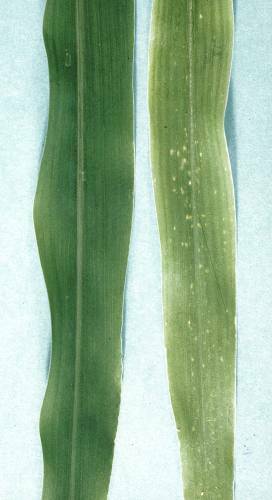 The chlorotic leaf spots were needle-like in shape and measured approximately 1 to 1.5 mm in diameter (Figures 1 and 2). One fungus was consistently isolated from these spots onto potato dextrose agar (PDA). In culture, it produced a pinkish-white mycelium with black, slimy conidial masses protruding from the surface. No other fungus was associated with the chlorotic spots. After seven days growth at 22 °C, the fungus reached 80mm in diameter on PDA, 65mm on corn meal agar (CMA) and Czapeck solution agar (CzSA), and 30 mm on nutrient agar (NA). Sporulation was good on PDA and CzSA but poor or absent on CMA and NA. 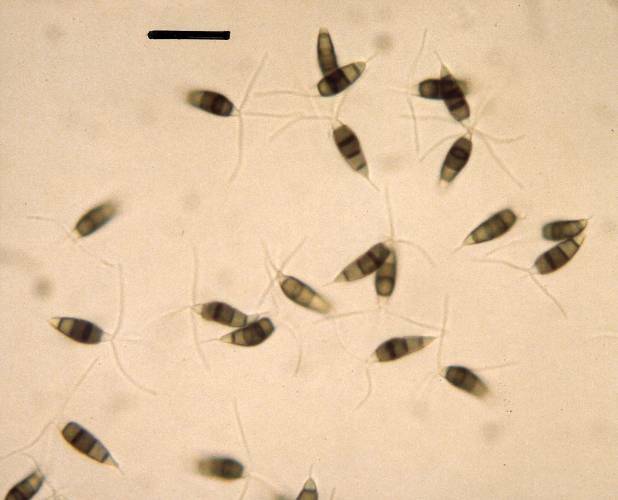 The conidia produced in culture were 5-celled, narrow fusiform, straight or slightly curved, with a tapering base (Figure 3). They measured 26 µm x 7 µm, with 3 apical setulae of 15-25 µm length and a basal pedicel of 7 µm length. The two apical cells were hyaline, cylindrical to conic. The three intermediate cells were dark brown, with the two upper ones sometimes darker. These differences were highly distinguishable by immunofluorescent microscopy of conidia stained with acridine orange. This description matches that of Pestalotiopsis neglecta (Steyaert, 1953). Cultures of the fungus are maintained at DGISP, Denmark. The fungus isolated from the chlorotic spots was also associated with maize seeds. In seed health testing of 8 maize varieties grown in Cameroon, 1 to 21% infection levels were recorded. In fulfilment of Koch's postulates, symptoms similar to those observed in the field were observed five days after 4 week-old maize plants, variety CMS 8501, were sprayed with a suspension of 106 fungal spores per ml taken from a PDA culture. These pathogenicity tests were conducted at DGISP in a growth room at a constant temperature of 25°C and 12h light and 12h darkness, conditions corresponding to those in the district of Yaounde at the time the disease was observed. The same fungus, Pestalotiopsis neglecta, was re-isolated from these symptoms. Pestalotiopsis neglecta has been reported to cause leaf spots on kiwi plants (Kinji et al., 1996). This is the first record of the fungus as a pathogen on maize. Further studies are being undertaken to examine its impact on yield, seed to plant transmission and other possible sources of infection. Kinji U, Nobuo A, Nobuhira K, Junko O, 1996. First report of Pestalotia disease. Anthracnose and angular leaf spot of kiwifruit and their pathogens in Japan. Annals of the Phytopathology Society of Japan 62, 61-68. Steyaert RL, 1953. New and old species of Pestalotiopsis. Transactions of the British Mycological Society 36, 83-84.